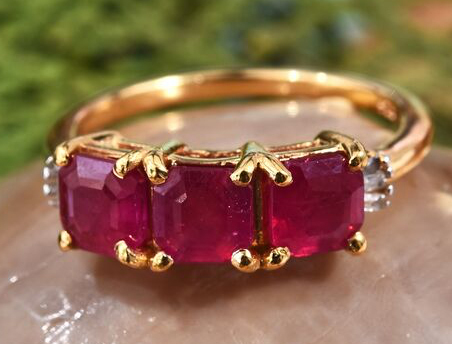 Rubies are prized as fiery, sensuously passionate gems with a deep lustre and gleam. While it has been believed throughout the ages that these stunning precious stones have magical healing and protective powers, their extraordinary beauty is more than enough to justify their consistent popularity. Rubies get their name from the Latin word "ruber", which describes the colour red. One of the hardest minerals known on earth, these gems measure 9 on the Mohs scale of hardness, which is second only to the strength of diamonds. India has been considered as the home of rubies for over two thousand years – in the ancient Sanskrit language they are called 'ratnaraj', translated as "The King of Gemstones". Ruby gemstones are of the mineral family known as corundum. Interestingly, only the red variety of corundum is classified as ruby, while the main other colour types would be in the category of sapphires. It is additional elements such as chrome, iron, titanium and vanadium which create the incredible fiery hue of rubies. Their astonishing colour varies from light to dark red and they often have secondary undertones that range from pink, orange and brown to purple. Rubies are prime symbols of passion and vitality – their unforgettably striking colour is representative of fire and blood, which in turn denotes the warmth and energy that sustains humankind. This exquisitely fiery gem makes for an outstanding addition to any jewellery item. Always opt first for a ruby based on its colour – blood red is ideal. Even quality rubies have inclusions (inner fissions), but try to find one which has as few as possible. The cut of the ruby is extremely important since this will bring out the fire in the stone. High quality, natural rubies are very rare and expensive so they should always have a certified Certificate of Authenticity.